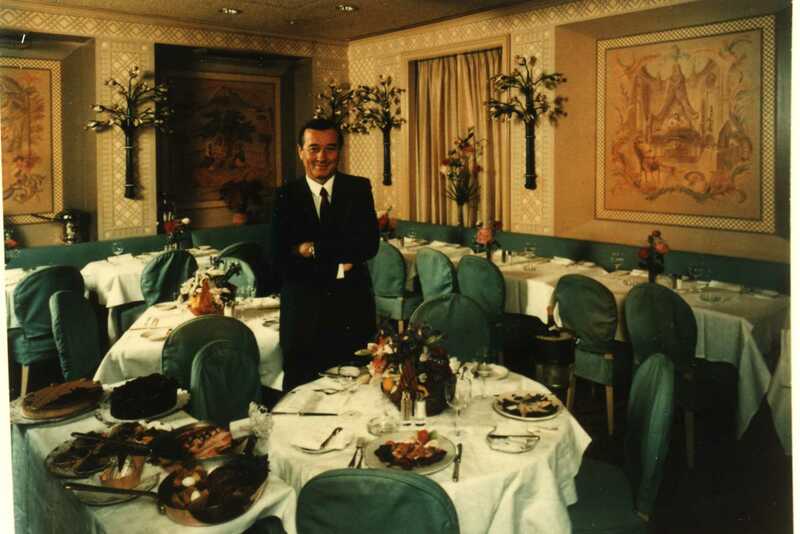 Sirio Maccioni at Le Cirque on 65th Street. Email me. I want to know what you think. Lutèce: With Alsatian André Soltner in the kitchen (almost constantly; in 34 years, he only missed five nights), Lutèce sets the gold standard for what a French restaurant should be in America despite Craig Claiborne’s snarly first one star review in l961. Four stars finally come in 1980. Early on, winos are stunned when owner André Surmain decides to price wine at market price, ending the days of the $5 Bordeaux. Keepers of caves across town quickly follow suit. Maxwell’s Plum: The grand café as Show Biz. A mythic mating bar, kaleidoscopic stained glass ceilings and jungle of Tiffany lamps. As exuberant as its impresario Warner LeRoy, rotund form wrapped in wild plaid taffeta suits, arms flung wide, welcoming 1200 customers a day. Young Drew Nieporent at the podium. 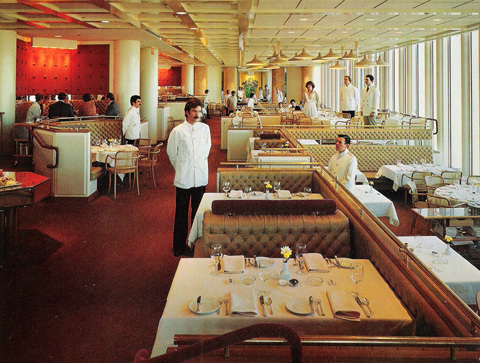 The ambition of its eclectic American menu -- hamburgers and chili to caviar and stuffed squab – wins Claiborne’s four stars in the late 1960s. Shun Lee Dynasty: Chef T.T. Wang’s Uptown Upscale Chinese with Michael Tong at the door, first Chinese four star sets scene for Shun Lee Palace, David Keh’s empire, a confluence of Chinese master chefs in late 70’s, giving the city the best Chinese eating it has ever had, though not for long. Le Cirque: In all of its incarnations from 1974 to today, the hand-kissing Sirio Maccioni’s A-list eatery has been both a club for defrocked presidents, the jet set and the ladies-who-lunch crowd, and a serious eatery, proving ground for Daniel Boulud and Sootha Khun. Blame Le Cirque also for the rediscovery and eventual abuse of crème brûlée. The smartly tiered Windows gave window views of a sort to every table. Windows-on-the-World: This instant landmark floating 102 stories in the sky was Restaurant impresario Joe Baum's brilliant comeback from exile by Restaurant Associates, signaling a financial turnaround in the city's darkest economic moment, key to revitalizing Lower Manhattan. “The Most Spectacular Restaurant in the World” is the headline on New York’s cover in May, 1976. River Café: The genius was not just in a riverfront view of Manhattan from Brooklyn in l977, after a 14-year struggle by Buzzy O'Keefe, and instantly the most romantic restaurant in town. Would it trigger a tide of waterside restaurants? Alas, no. But Chef Larry Forgione’s determined farm, ranch and geographical credits for every periwinkle and prawn on the menu portends product-envy to come. Getting O’Keefe to subsidize a chicken raised to Forgione’s specs leads to first “free range” birds in 1980. Also a nursery for star chefs Charles Palmer, David Burke, Rick Laakkonen and Brad Steelman. Barry Wine shows off truffles and beggar's purses at Quilted Giraffe. Quilted Giraffe: Transplanted in 1979 from its innocence in New Paltz to a Greek coffee shop on Second Avenue (Barry and Susan Wine lived above the store like André Soltner around the corner), Giraffe set nouvelle cuisine style with outsize service plates, the first degustation in NYC, the Grand Dessert tasting, and later, Japanese small plates and sous vide, recruiting American chefs Tom Colicchio, Wayne Nish, Jan Birnbaum when few French restaurants would hire Americans. Back in New Paltz, the Wines grew their own asparagus and pea sprouts and on weekends Susan gathered fraises du bois. At the same time, Chanterelle lights up nighttime desolation in SoHo. Odeon: In 1980, with no money but lots of style, Lynn Wagenacht and the McNally brothers Brian and Keith didn’t only help create a trendy New York neighborhood in a former industrial wasteland. They made a faded Deco cafeteria with Patrick Clark’s nouvelle cuisine into the American bistro prototype and paved the way downtown. This is how Gotham Bar and Grilled looked the day Alfred Portale arrived to remake its image. Gotham Bar & Grill: Gotham almost faded away until in l984, chef Alfred Portale bonded French technique to an American sensibility, setting a new casual-but-crisp tone that became nothing less than the modern New York restaurant standard. Later, Portale’s daring tall food becomes America’s plating rage. 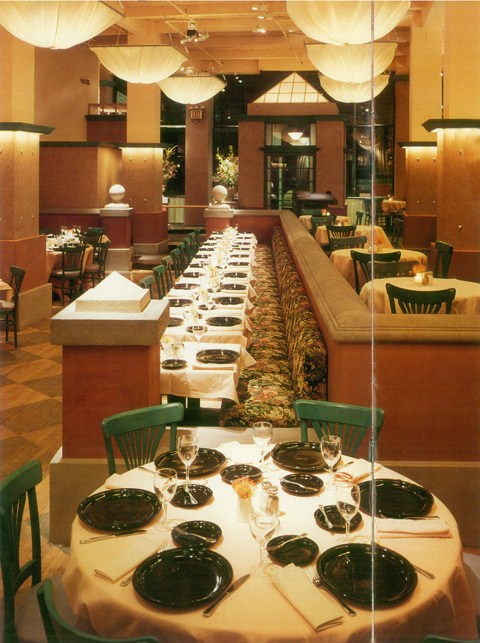 In fall 1985 the same shirt-sleeves casual and well-tended cellar with a neighborhood feel sets the tone at Union Square Café, flagship of what will be Danny Meyer’s ever-expanding feeding fief with an amazing dividend – Meyer’s leadership in the rebirth of Madison Square Park. Gilbert and Maguy LeCoze set to conquer New York with their revolutionary minimalism. 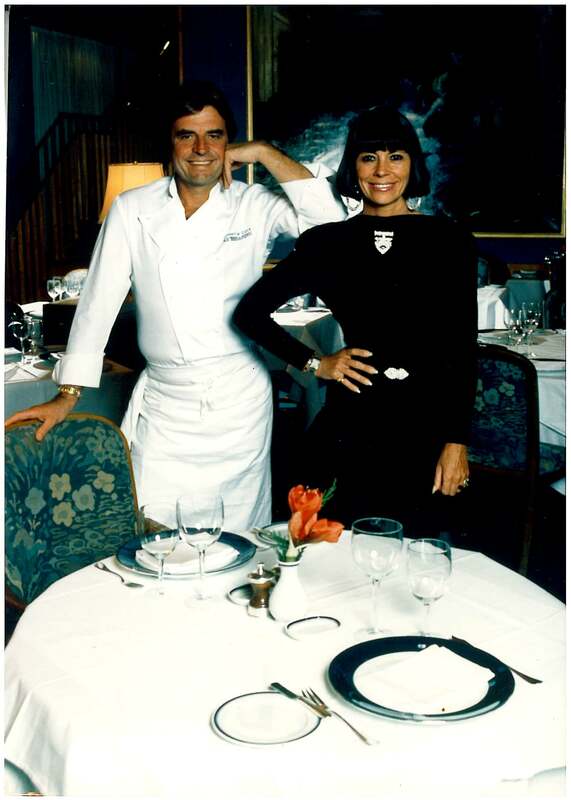 Le Bernardin: The Parisien brother-and-sister act Gilbert and Maguy LeCoze beguiled foodies in January, 1986, with their shockingly fresh apprach to seafood: tuna carpaccio, tomato-foamed salmon, and lowly halibut in green sauce, lending instant caché to Equitable’s new home on a tacky Westside street. It forever changes the way Americans cook and eat fish. Eric Ripert keeps the gospel brilliantly. Lafayette at the Drake: Jean-Georges Vongerichten’s French-Asian fusion makes its U.S. debut here as ambassador for Michelin three star Louis Outhier. 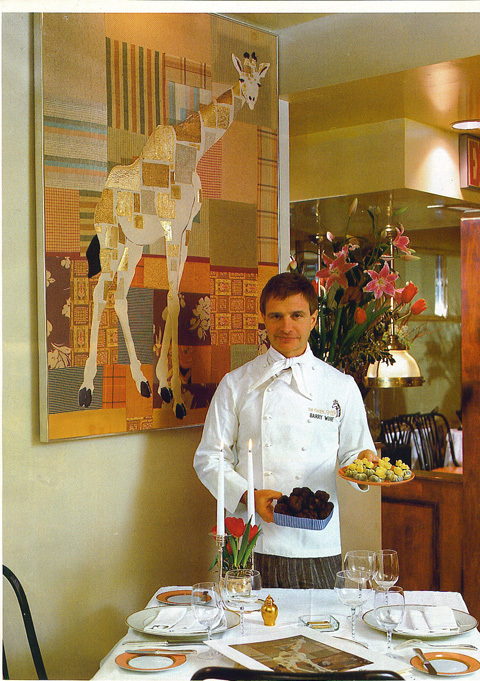 Then, on his own in 1987, disdaining cream and classic French stocks, he launches a startling menu divided into les vinaigrettes, perfumed oils, vegetables jus – changing the flavor palette of new American cooking and winning four stars in 1988. San Domenico: Tony May’s 1988 take on the uppercrust style and regional taste in this Imola offshoot (after introducing carpaccio, house made ravioli and tartufo at his Italian Fortnights in the Rainbow Room in 1972) is a hothouse for star chefs: Theo Schoenegger, Paul Bartolotta, Scott Conant, Odette Fada. May’s Gruppo di Ristoratori Italiani, emphasizing imported Italian products, unites owners “to improve the image of Italian cooking through education.” May’s now defunct Palio and Sandro (recently revived) are aperitivos of serious Italian eating before the age of Batali. Nobu: Impresario’d by Drew Nieporent, Nobu arrived in 1994 with ice-cold sake, gold leaf fluttering on toro, Peruvian-Japanese fusion and partner Robert De Niro’s private room for movie and music bigs. It is serious Japanese made accessible, given a unique American--no, New York--twist. Babbo: Mario Batali’s feisty rock-n-roll, upmarket Italian rustica with in-your-face innards, civilized by Joe Bastianach’s somber wine rituals leads to Lupa, Roman classics with market greens, inciting a citywide, culture-crossing frenzy of cured meats, and side effects like Mario’s video stardom, absentee chefs and pop goes the Food Network.